Shopping trips now comprise fewer than 9% of all trips, down from 12.5% in 2000, according to our analysis of the Twin Cities Travel Behavior Inventories. This is consistent with other results from the American Time Use Survey. They are down by about one-third in a decade. Trends in Shopping Travel in the Minneapolis-St. Paul region. 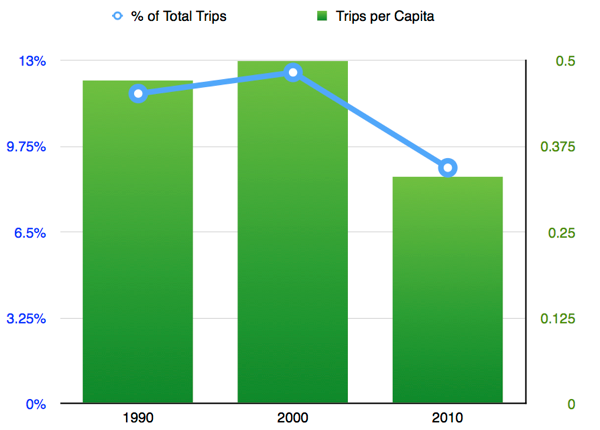 Source: Metropolitan Council Travel Behavior Inventory. When we want to eat at home but not prepare the food, urban dwellers have options. Some restaurants offer Delivery as well as Take-Away, others offer Take-Away but don’t Deliver, and some specialize in Delivery and avoid the storefront. For the customer who is not out and about, Delivery is more convenient. For the customer who is passing by the restaurant anyway. Ordering ahead and doing Take-Away makes a lot of sense, since there is no waiting for the delivery, the additional distance is small to nil, and tipping charges (or delivery surcharges) are avoided. Drive-thru is Take-Away for fast food (though you can still go into the establishment and take-away as well), which avoids the pre-ordering step, arguably at the cost of food quality. When we want to consume non-food items, we also have options. There is of course the store. The block I live on of mostly single family homes with some duplexes and apartments, in a quiet Minneapolis neighborhood, once had two small grocery stores, founded before the days of cheap at home refrigeration and before larger grocery chains took off. One is now housing, the other a small restaurant. If we did not have easy access to the store, or the store’s variety were limited, we could order from a catalog, like the Sears Wish Book. The catalog era was enabled by Rural Free Delivery, and was as fast as the supply chain of the time (which is to say, as fast they could, but nothing like today). Door-to-door sales was also common in this period, as there would be more likely to be someone at home to sell to. Catalogs were replaced by the Internet, and Sears by Amazon. Not only can we do the same thing differently, we can do many more things with the technology of the world wide web. Amazon turns 20this year, so we cannot really consider this new anymore. The early dot-com boom had a number of firms attempting same day if not same hour delivery. That didn’t work out as well as hoped, but like video conferencing and automated (if not flying) cars, it is an inevitable part of the future. There are lots of models out there for solving the last mile delivery problem less expensively than today: lockers or drop boxes (for less shipping costs, goods will be delivered to a locker rather than your doorstep), peer-to-peer delivery services (friends will pick up goods for you), and so on. Today we already have three national networks doing delivery which are cost effective for many types of goods (USPS, UPS, FedEx), as well as specialists (local stores that deliver their own products (furniture, appliances, grocers, newspapers, milk), though one can certainly imagine some others emerging. Amazon is even trying to patent pre-cognition, sending you what you are going to order before you order it. What goods will you have delivered? Anything that is standardized, commodified, and whose delivery is easily automated. Amazon entered the market with books, and decimated the big box book sellers like Borders and Barnes and Noble. Borders and B&N had earlier acquired and then put-down many mall-based neighborhood bookstores (Walden, B-Dalton). The mall-based chains had themselves pushed out the independent neighborhood bookstores. For the book reader, we now have access to many more books than we did 20 years ago. For the nostalgic, we obviously lost something as well. Such is progress. Books were relatively easy kindling for this revolution, the International Standard Book Number (ISBN) code had been around since 1965. There is a long-tail of desired, but still standard items. There are economies of scale. They are easy to ship (and even easier to ship in electronic versions). Music is seemingly similar. Once there was the neighborhood record shop, then the national (mall-centric) chain, then big boxes started to get in on the act. The technology of music changed faster than the book, moving from vinyl to tape to CD. In contrast with books, customers digitized and shared their music before the music industry could get their act together. Ultimately Apple’s iTunes brought prices down enough that listening to music is again more legal than illegal, and then new distribution mechanism (internet radio) changes the market again. Music is standardized, commodified, and the sequence in which you listen is automatically customizable using services like Pandora and iTunes Radio, among many others. While there is copyright-violating sharing of eBooks, it is not of the same order of magnitude as music. (Just search for your favorite book followed by PDF, you might be surprised to find it on a non-US website). Is downloading my own book illegal? And then we get other items, all commodified though not digitized, that are amenable to the new distribution system: from batteries to baked goods, from Kindles to kites, which can all be ordered and delivered within 48 hours (if not sooner). Even custom goods get sold on places like Etsy. While used (and new) items both standard and non-standard are offered on Ebay. All of these deliveries reduce my travel to the store, while increasing travel in the logistics supply chain, but generally reduce travel overall. The decline of shopping travel is one aspect of the decline of personal travel overall, and has many knock-on effects. We need fewer roads. We need less parking. We need fewer stores and shopping centers. We inventory more at home (delivery might entail different economies of scale than fetching from the store). We might engage in other out-of-home activities to substitute for shopping as “entertainment”, but it won’t fully substitute. Eventually we may have replicators, or pneumatic tubes, or good 3-D printers, and delivery as we think of it now will also decline. Or we may decide to consume less overall. But we can fairly safely extrapolate that, for a while, our 20th century retail infrastructure and supporting transportation system of roads and parking is overbuilt for the 21st century last-mile delivery problems in an era with growing internet shopping. David M. Levinson is Professor of Civil Engineering and RP Braun/CTS Chair in Transportation at the University of Minnesota. He is also the co-author of the second edition of The Transportation Experience: Policy, Planning, and Deployment.